Darrell Royal is considered a coaching legend and figurehead at the University of Texas, where he helped shape the program into a national power. While serving in the Air Force during WWII, Royal was discovered by recruits from the University of Oklahoma. He’d attend college there and play both defensive back and quarterback for the Sooners from 1946-1949. Mentored by Bud Wilkinson, Royal posted a 16-1 mark as a part-time starter at quarterback, while recording 18 interceptions as a defensive back in his time there at the school. With professional football not a firm career option at the time, Royal opted to jump into coaching at the college level serving as an assistant in 1950 at NC State, Tulsa in 1951, and Mississippi State in 1952. After a brief stop as head coach of the Edmonton Eskimos of the CFL in 1953 (where he posted a record of 12-4), Royal returned to Mississippi State in 1954 to be head coach for two seasons posting identical back to back 6-4 records. Continuing to puddle jump, Darrell spent a year as head coach of the Washington Huskies in 1956 and recorded a pedestrian 5-5 record. A hungry Texas Longhorn program liked what they saw in Royal and hired him in 1957. He’d immediately turn around the program and coach them to the Sugar Bowl. Over his time at the University of Texas Royal brought the school 11 Southwestern Conference championships (’59,’61-’63,’68-’73, & ’75), 3 National Titles (’63, ’69-’70), and numerous coaching awards. He’d post a record of 167-47-5 at UT, and a mark of 109-27-2 in the SWC. Also of note is that Darrell was considered an offensive mastermind, and is credited with two offensive formations: the ‘Flip-Flop’ Winged-T and the Wishbone offense. He’d retire in 1976 as the winningest coach in UT history, but remained a constant figure on campus at the institution through 2012, as a watchful during the current highly successful Mack Brown era. The school renamed the stadium in 1996 from Memorial Stadium to Darrell K Royal Memorial Stadium to honor his contributions to the institution further. He was inducted into the College Football Hall of Fame in 1988 and the Oklahoma Sports Hall of Fame in 2000. Coach Royal also has a huge coaching tree. While Fred Akers quickly came in and established himself as head coach after his departure, many of his other coaches had prodigies that later became NFL and successful college coaches from them. Among those distant relatives are RC Slocum, Mike Sherman, Gary Kubiak, Greg Davis, Tommy Tuberville, Spike Dykes, Dave McGinnis, Al Groh, Ray Perkins, Jackie Sherril, Jimmy Johnson, Dave Wannastedt, Dom Capers, Ron Zook, and even Jon Gruden. 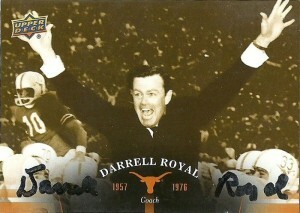 I was really happy to get Darrell Royal. Even my parents were excited to hear I got him on two cards. I opted to have him sign his coach card and the stadium card, over the additional cards I had and it was all done in under a month’s time. My uncle had previously gotten him for me before on a postcard back in the late 90s while they were on a flight together. 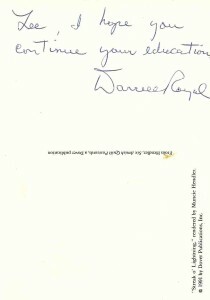 Coach Royal encouraged me in the note to go back to school and finish my education. 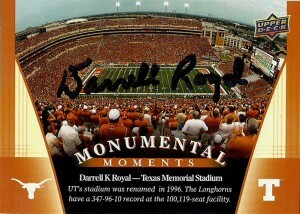 On Wednesday, November 7th 2012, Darrell Royal passed away at the grand old age of 88. He is survived by his wife Edith and 3 kids. In his latter years, Darrell enjoyed golf and philanthropic activities immensely. On a side note, Royal’s passion for golf spilled over into the college, and while athletic director there, he helped bring the sport to the National limelight as they captured 2 titles under his encouragement with headliners Ben Crenshaw and Tom Kite.